In this program, we need to calculate the sum of elements in each row and each column of the given matrix. 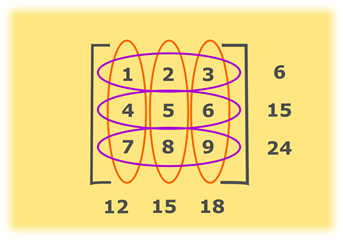 Above diagram shows the sum of elements of each row and each column of a matrix. Calculate the number of rows and columns present in the array a and store it in variables rows and cols respectively. Maintain two variables sumRow and sumCol to store the sum of elements in the specific row and the sum of elements in specific column respectively. Two loops will be used to traverse the array where the outer loop selects a row, and the inner loop represents the columns present in the matrix a. Calculate the sum by adding elements present in a row. Two loops will be used to traverse the array where the outer loop select a column, and the inner loop represents the rows present in the matrix a. Calculate the sum by adding elements present in a column. Repeat this for each column.